Grab (formerly known as MyTeksi) is a Singapore-based technology company offering ride-hailing and logistics services through its mobile apps in Singapore & neighbouring south-east Asian nations such as Malaysia, Indonesia, Philippines, Vietnam, Thailand, Myanmar and Cambodia. Popularly known as the 2-tap taxi calling service, Grab is by far the leading cab-hailing player in one of the fastest growing markets of the world. With abundance of driver partners, Grab also markets itself by saying 'Call a taxi in less than a minute'. Lowest prices, carefully chosen & trained drivers and well maintained cars are what make Grab popular. Book in Just 2 Taps: Key in your pick-up and drop-off locations to get your estimated fare. 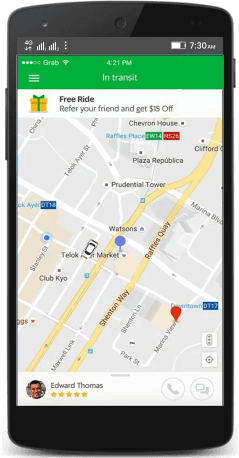 Get a Driver: Grab will find you the nearest available driver. Track Your Driver: Know your driver's location and estimated time of arrival in real-time. Arrive Safely: Share your trip details with loved ones for added safety or even just to let them know you're on your way. Grab basically uses the same popular (& working) formula of letting the users request for a cab in 2 taps & then allowing the nearest available driver accept the ride. It puts real time map tracking to the best use & caters to the ever growing population, hungry for safe & better yet cost effective public transportation. One really useful thing Grab does is that it provides personal insurance coverage in case of unfortunate accidents for all its riders. GrabTaxi: Book a budget or premium taxi from Southeast Asia's largest network of drivers. GrabBike: Get around the quickest way possible, as a bike passenger. GrabHitch: Hitch a ride or give someone a lift with the social carpooling community. GrabShare: Carpool with another party heading in the same direction and save up to 30% less on fares. GrabFamily: Enjoy peace of mind, with a child friendly booster seat for your youngest travellers. GrabExpress: Send your parcels and documents with a delivery service you can trust. Variety of options: GrabTaxi, GrabCar, GrabBike, GrabShare etc. Request for training, code of conduct etc. Andolasoft, a global web & mobile apps development company based out of San Jose, CA, USA with an offshore centre in India can help you develop a Grab like app in quick time.